"If you like rich casseroles you'll love this!! Green beans are baked in a creamy cheese sauce with a zesty seasoning." Place the processed cheese into a large microwave-safe bowl along with the cream of chicken soup. Heat on full power for 2 minutes, stirring occasionally, or until cheese is melted. Season with salt, pepper, and Cajun seasoning. Stir in the green beans. Pour into a 1 1/2 quart casserole dish, and sprinkle the French fried onions over the top. Bake for about 20 minutes in the preheated oven, or until the top is crispy. this was ok. 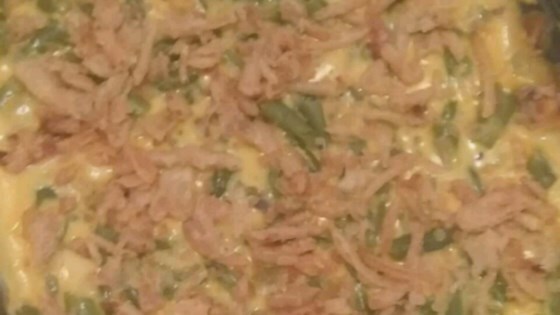 I usually make green bean casserole with cream of mushroom soup and it turns out WAY better but this was ok. This is very similar to a recipe I've used for years. Instead of cajun seasoning, I use Ro-tel tomatoes. Any brand of diced tomatoes with green chiles will do. My husband and I really loved this recipe. I followed it to a tee and it turned out perfectly. And now I'm making it again tonight!